After graduating from Yale, Whitney headed to work as a tutor in South Carolina. When upon arrival his proposed salary was halved, he accepted the offer to settle on a friend's plantation in Savannah, where he would make his cotton gin breakthrough. 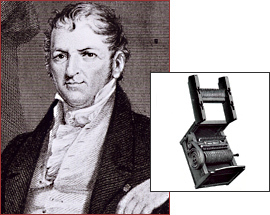 In popular mythology, Eli Whitney has been deemed the "father of American technology," for two innovations: the cotton gin, and the idea of using interchangeable parts. Eli Whitney was born in 1765 and grew up on a Massachusetts farm. During the Revolutionary War he manufactured nails to fill the demand caused by British embargos. Young Eli quickly learned how the marketplace worked, and diversified into hatpins and canes. It was his genius to observe what people needed, and to provide it. After working his way through college at Yale, Whitney moved to South Carolina. There he saw how hard it was to separate the green seeds from short-staple cotton. In just a few days in 1793, he invented a machine that could do the task ten times faster than a slave doing the work by hand. The cotton gin revolutionized agriculture. It also made possible the cotton economy of the American South, perpetuating and increasing the practice of slavery upon which the agricultural system depended. In 1798, Whitney, who had not seen much profit from his epochal machine, launched a new venture: arms manufacturing. Once again he observed carefully, noting a war scare with France, and delivered something necessary and innovative: arms that he claimed he could produce more efficiently with the help of machines. His idea of machine-made, interchangeable parts was the beginning of what would become known as the "American system" of mass production. Although other Americans would create this system in their industries, it was Whitney who popularized the idea and was instrumental in lobbying politicians to pass legislation to standardize arms production. Whitney was also one of the first Americans to marry the ideas of republicanism and technological progress. A shrewd employer, Whitney advanced the paternalistic factory system that would characterize the American industrial revolution by linking economic progress with the Puritanical attributes of diligence, sobriety, and thrift. Whitney died in 1825.